We would all love a memento of a great celebration party, wedding reception or event. 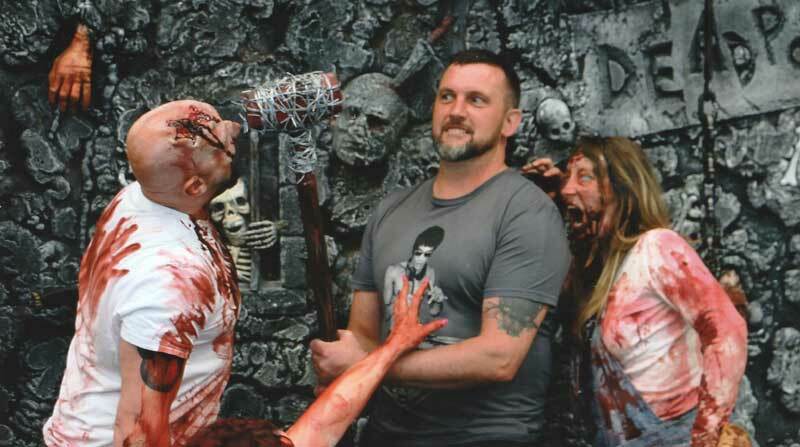 Well our fun and interactive DeadPose Instant Print photo booth does just that. We create amazing theatrical and themed photo shoots for any celebration or event, with a professional photographer, professional lighting, bespoke horror scenery or green screen backdrop and an instant print photo service. Mix all that with live zombies, Special Effects Make Up, props to interact with including imitation firearms hammers axes and more, false limbs and even zombie heads, posing being eaten alive or slaying our undead, your guests are going to love it and have the perfect memento to remember the event by. DeadPose the "Live" Zombie Instant Print Photo Booth. Great fun for Birthday Parties, Wedding Receptions, Halloween Party, Christmas Party, Comic Cons, Horror Conventions, Exhibitions and Trade Shows. Make your Corporate event stand out. Surprise your guests and make your Wedding Wicked. Child Friendly Zombies no matter what their age. A multitude of Props, Weapons (including realistic imitation firearms) available to create the ultimate Zombie Slayer pose. Scenery and Backdrops including Green Screen available to create the perfect surroundings for the shot. Our very own Choreographer to create your pose. Professional Cameras and Lighting used. We also have BattlePose (Become The Hero) available if you want something a bit less Horror related. Please contact us using the form on the Contact Us page.